Industrial design has been making inroads since people began converting former manufacturing spaces into residential lofts. Industrial design has been making inroads since people began converting former manufacturing spaces into residential lofts. So it was a matter of time before non-loft dwellers would want that creative look in their own homes. 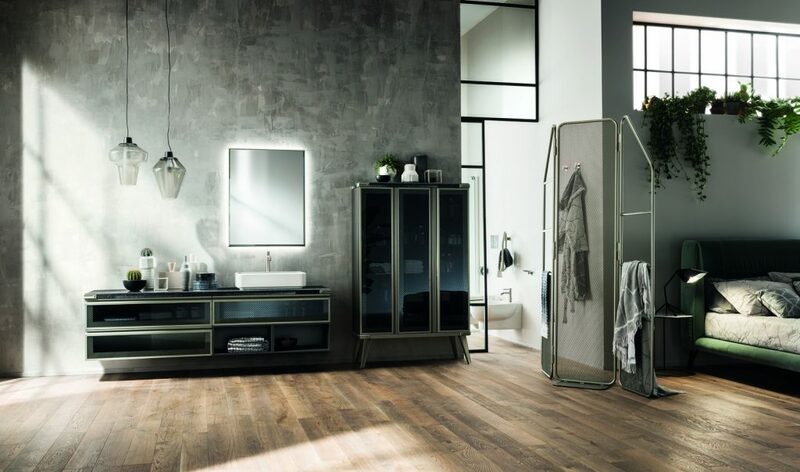 A new industrial look has made its way to the bathroom and you needn’t live in a loft to add its beauty to your own space. Scavolini, the Italian kitchen and bathroom products designer and manufacturer, makes stylish use of metals and open-concept shelving units. The company that made a name for itself with kitchens is now focused on bringing a modern vibe to the bathroom. 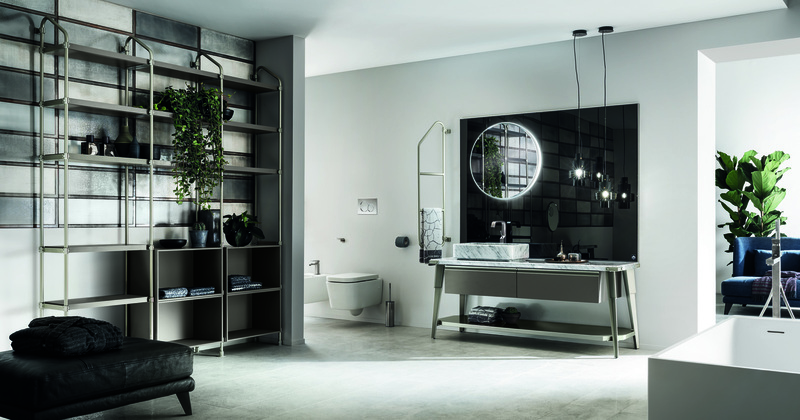 Designed by Diesel Living, the bathroom that Scavolini has introduced is called the Deisel Open Workshop line, a new collection that introduces a warm yet distinctive industrial look to an intimate space within the home. The collection incorporates such metallic structures as tubular towel racks, floor-standing screens and mirrored panels, to set the tone. The industrial design is further developed with the use of modular shelving systems, which provide for the insertion of shelves and open-fronted compartments of varying sizes. The line also includes new built-in washbasins with marble finishes, smokey glass fronts and custom-designed faucets with iron supports. And not to be overlooked are the open-fronted bath structures that come with metal legs, a cover and a coordinating lacquered shelf. But what would a bathroom be without mirrors? This is where the new Diesel line reflects the softer side of the industrial look. 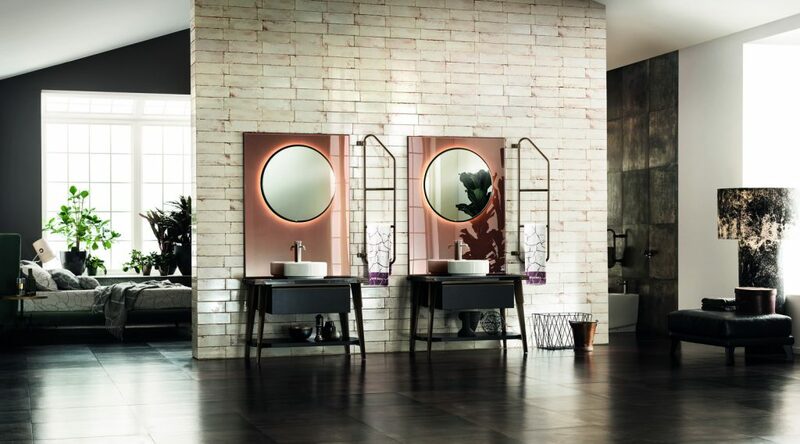 The distinguished copper-effect Stopsol mirror panels are perhaps the best example. 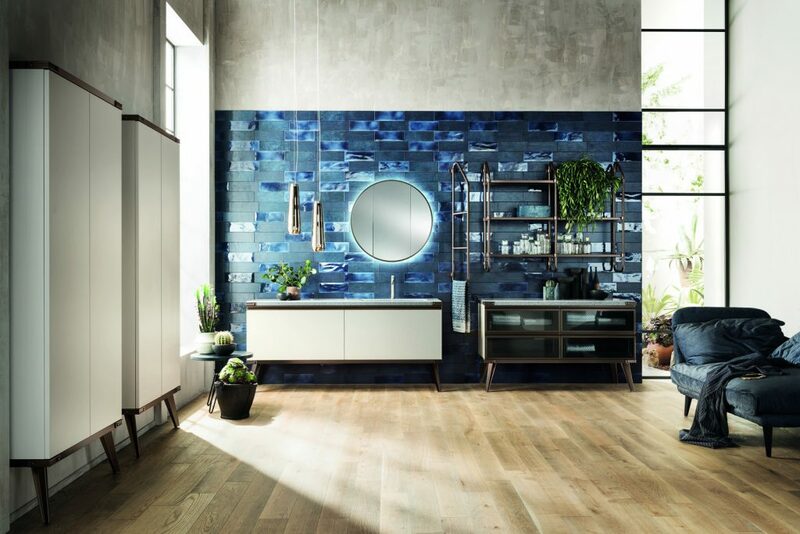 These panels create a backdrop to the bathroom cabinet or industrial-styled open-shelf vanities. The Diesel Open Workshop line is available in three distinct configurations, each with its unique combination of stone, metal and colours. Modern and distinct, sleek yet soft. These bathrooms are part of Scavolini’s industrial evolution.